As the rain falls here in Denver, I was looking through some images I took in the past month. 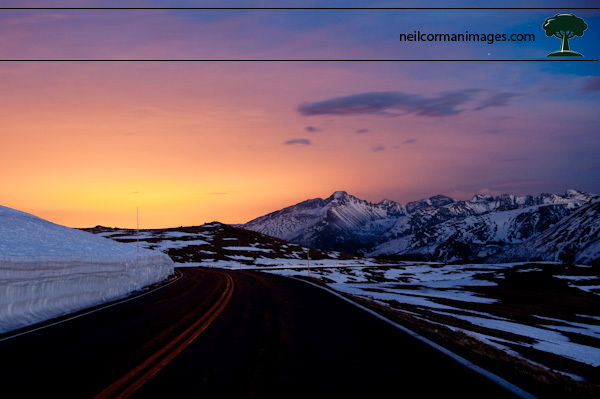 It was just over two weeks ago I headed up to Rocky Mountain National Park and Trail Ridge Road prior to it opening for the season. As I parked at the Forest Canyon Overlook and started walking up the road I photographed along the way. The plan was to make it as far as I could for sunset, which ended up being just about to Iceberg Pass. I was treated to an interesting sunset and started back along the road. Getting close to the car and about an hour after sunset I noticed the city lights of Denver in the distance and grabbed the following photograph. The brighter colors in the image are due to the light pollution from the city. After looking at this image, I decided to make it something which would be available to folks who donate towards my Team in Training fundraising efforts. At the top level if there is a different image you would like let me know and that can be arranged as well. Now as it is raining here in Denver, I know at 11,000+ feet at this spot the road is covered once again in snow and closed. Copyright ©2004-2019 Neil Corman Photography · All rights reserved.